Like any relationship, the bond you develop with your horse requires work and commitment. Success can leave you feeling on top of the world but when you hit a problem it can be hard to know how best to move forwards. At Skylands, we understand this. Our coaching approach does not focus on standard ways of working and traditional ‘lessons’. Coaching is about listening as much as telling, experimenting as much as dictating. Coaching is working hard about developing trust and understanding to get to long term improvements. We take pride in building strong relationships between horses and riders. Our approach offers intensive, individual support, working towards specific goals. 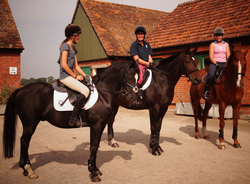 We offer you the exact support you need to get the best out of your horse - whether your goal is Badminton or mastering the perfect working trot.